Day 10 of a '28 Days to a Healthier You' programme and all I can think of is cheesy, tomato-y, sour cream-laden chicken enchiladas! The thought won't go, so I'm giving in and putting the health kick on hold - just a day! Little did I know that that deciding to make enchiladas would be the easy part. I've seen so many great photos of Mexican food, I assumed finding a recipe would be easy. However none really hit the spot. I've got this really specific taste in mind - a rich, smoky tomato sauce and flavoursome chicken - and of course cheese - lots of it - melted and golden. So this recipe is a combination of about 6 I found on the Internet. Would love to know what you think. I've been waiting forever to use that heading! However meals like this are for once in a blue moon, so I'm going all in! Though as a nod to making it a meal in one, I did add some greens and some vegetables! Check the tips at the end if you want ideas for a simpler, quicker or healthier version. So it seems like a lot of ingredients and there are! (And there are 3 I forgot in this picture! Brown sugar, stock cube and bay leaves) But this is the 'ultimate' version of the recipe - there are lots of ways to make it simpler and quicker. Also you will note in the picture below I used 4 chicken tenderloins. You have probably guessed where this is going - that was 2 chicken tenderloins too many!!! Lesson learned - don't cook when you are famished! 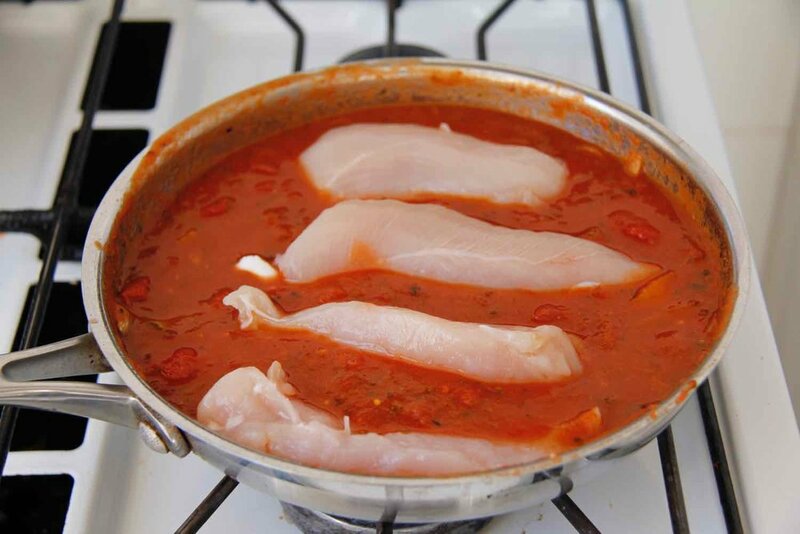 The proportions for the sauce remain the same, but the recipe will reflect smaller portions of chicken and vegetables so you don't end up with leftovers. Image above is of the vegetable prep done and the chicken tenderloins ready to shred. In previous versions I cooked the chicken separately. However, even though it takes more time and is a bit messier, I think it is worth poaching the chicken in the sauce. This is a meal to cook when you have a bit of time. BUT I'm not precious about it - so definitely jump to the tips and hacks at the bottom if you want the quick and simple version of this recipe. The recipe makes quite a large meal, 3 well filled mini-tortillas. Also it makes a lot of sauce, but annoyingly uses about 3/4 of a 440 gram tin of tomatoes. I like lots of sauce, and also for the sauce to simmer for 15 mins or so, so the flavours intensify. If you like less sauce, or want it thinner, you could easily do this with half a tin of tomatoes. The sauce I make is quite chunky as it includes chopped tinned tomatoes and chopped up onion, plus I simmer it for 15 mins or so, so that it reduces and becomes quite thick. 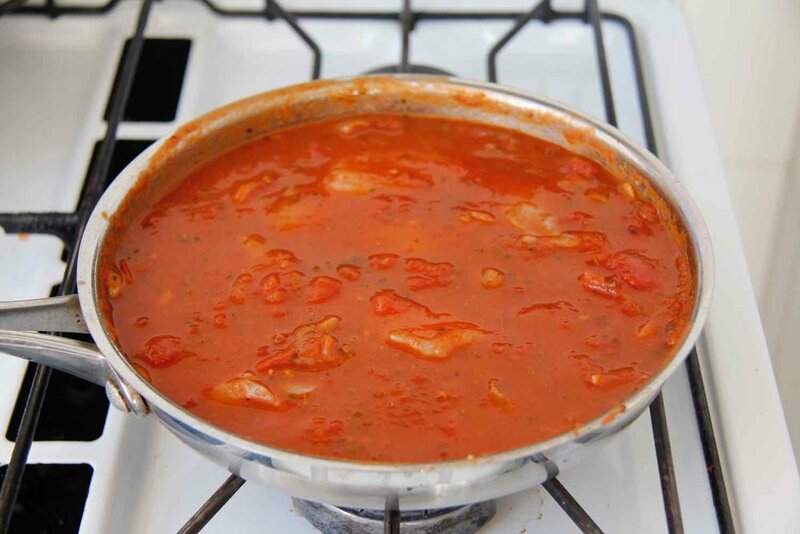 If you prefer a thinner sauce, options are to use Passata instead of tinned tomatoes or puree the sauce with a stick blender or simmer just for 5 minutes. Make it a little simpler: Use a packet of 'Mexican spice', e.g. simply saute the onion, then add the can of diced tomatoes (or passata if you want a smoother sauce) and as much of the Mexican Spice to suit your taste, then bring to the boil and simmer until the sauce has thickened. Make it healthier: leave out the sour cream and don't mix the cheese with the chicken, just use it on top. Add extra greens! e.g. could mix finely chopped broccoli and frozen peas through the chicken mix. Make it worth the effort: Make a larger batch to freeze. Or make larger batches of the enchilada sauce and also the poached chicken so that you can use it later in the week, or freeze in individual portions for future meals. I'll definitely be poaching 3 or 4 chicken breasts, shredding all the meat and freezing it into individual portions of 120 grams so that I have a base protein that can be used for other meals. Don't want to open a can/jar/packet of tomato paste: I think the tomato paste gives this a little more depth. But it's not essential and can be left out. Finding the right size dish is one of the hard parts of adapting traditional family meals for one person. If you don't have small oven-proof dish that will fit the enchiladas in nicely, I suggest making your own using alfoil. You don't want the dish to be too big, as otherwise the tomato sauce will spread too thinly and either burn the base of the dish, or just not be enough. Alternatively hunt down one of these Falcon dishes. I recently came across this brand - and it's changed my life! Amazing dishes with great sizes for cooking for one - AND, unlike most cookware that I lust after, really reasonably priced! Bubbling golden, cheesy chicken enchiladas for one topped with deliciously smoky home made mexican red sauce. A decadent, tasty, indulgent dish for one. Note: Spice level. This recipe has a VERY mild chilli taste. So please taste along the way and add chilli powder if you want to make it spicier. Preheat oven to 200°C/180°C fan-forced. Lightly grease a small baking dish that your rolled up enchiladas will fit tightly into or make your own using alfoil and baking paper. Heat tablespoon of oil in small skillet and heat over medium high heat. Saute onion until it is translucent, then add garlic and cook for an extra minute. Add cumin, paprika, oregano, brown sugar and adobe chilli. Cook, stirring, for 1 minute or until fragrant. Add tomato paste, tinned tomatoes, bay leaves and chicken stock. Add chicken to the pan and ensure it is submerged. Bring sauce to a gentle boil, then reduce heat to medium-low and simmer covered for 10 minutes, then simmer with the lid off for a further 10 minutes. Remove the chicken and if necessary simmer the sauce for a few extra minutes until it reaches the consistency you like. 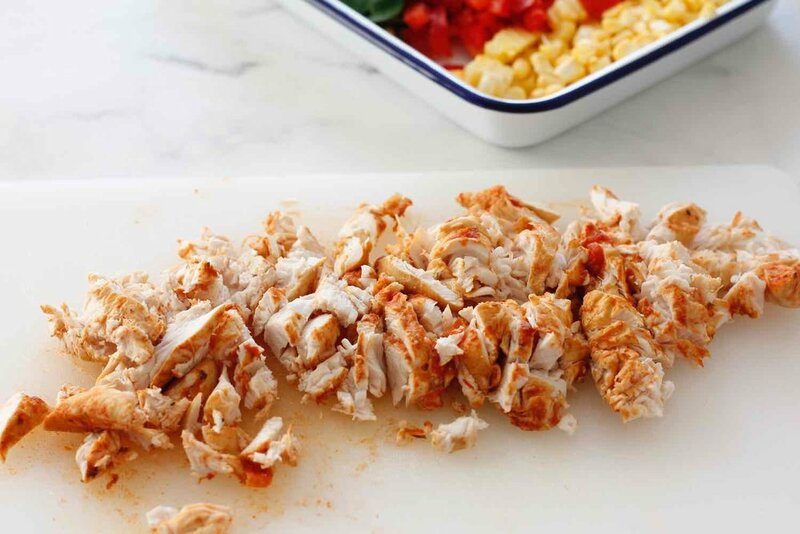 Shred the chicken then put it in a bowl. Add two - three tablespoons of the red sauce, the sour cream and 1/2 cup of cheese, then mix in the corn, spinach and red capsicum. Stir to combine. Spread 3 table spoons of the red sauce over base of prepared. Get your tortillas and prepare your enchiladas. Place tortilla on a flat surface. Top with a third of the chicken mixture. Roll up to enclose filling. Place, seam side down, on sauce in prepared dish. Repeat with remaining tortillas and chicken mixture. Cover tortillas with remaining sauce and then liberally sprinkle over remaining cheese. Place in the oven and cook for 20 minutes. Check at the 15 minute mark to make sure that the tortillas are cooking and not burning. If it looks like the cheese is burning, lower the oven temperature to 150. Remove from oven. Top with spring onion then serve with dollop of sour cream and side dish.